Let’s have it all out in the open from the get go: mea culpa. It’s my fault and given my track record with dead fish (poor, dear Myrtle), you’d think I’d have known better. What I should have done, once the Dwarf Guarami fish hit an apparent life crisis and began indulging in titchy neon Tetra fishy appetisers, was take immediate action. Particularly once the entire household had witnessed the bullying of Eunice the Angelfish. I did make the call and arranged for the aquarium return of the newly-named ‘Piranha’ (surely a point awarded here for resisting a loo flushing?). Then things got busy. Before you can hum the theme tune to Jaws, a week had passed and I fooled myself that the bigger Eunice was the fish with karma on her side and as long as everyone had full stomachs, all would be well. A month passed and apart from a couple of minor misdemeanours and Piranha time-out in the corners, everything seemed under control. Let it be know that throughout this month, I brushed aside no less than a zillion kid reminders for fish removal. Last night I forgot to feed the fish. This morning I performed an impressive series of distracting manoeuvres whenever a kid ventured within fish tank viewing distance. This afternoon, after trawling three aquariums, I purchased a spottier, blacker, almost entirely unconvincing Imposter Eunice. No doubt she could have done with an orientation program: a settling in period. But I’d already maxed-out on evil and with a school pick up deadline, in she went without ceremony but with a handful of extra weedy disguise. My children have an apparent inability to locate an object lying directly beneath their noses and my aim is to keep Imposter Eunice swimming at some speed. All my bets are on this infinitesimally small chance to get away with one impressively dodgy bit of parenting. It’s a theory. There may be a need for a Plan B. It's abundantly clear that you're able to spin a yarn or two, so I'm sure you'll have a fine tale to tell the kids should they question Eunice's new appearance! I completely support you in this act of evil. We have fish here, and I know I'll have to pull the same one one of these days. Oh dear. Poor fishies. I had two fish (Marks and Spencer) and Spencer ate Mark one, two and three. Even though Mark Three was twice his size. Thus ended my fishy episode. You've got the support of this momma in you're act of "dodgy parenting". I used to wish my mom would do that when my sister's fishies kicked the bucket. We had to have full on funerals with obscene quantities of tears for the finned critters...no toilet flushing would do. The best of luck to you! Am crying. cant type for laughing. Fish are troublesome pets. There's no doubt about it. We periodically had fish who chose to take their own lives for some reason. I've had to step back from the trauma of living with fish. Hope you succeed in your wickedness! I'm all for the pasth of least resistance and with kids, this ath is taken OFTEN! Failing the "keep it moving" approach, I like the hairdresser story. You're plan might just work . But there are a couple of snags . Anything you don't want someone to see is seen and , at some stage , Eunice will die of overexertion . Good luck ! nemo no good. nemo dead!!! lol I have a friend who was convinced her budgie lived 20 years, she was devastated when she found out as an adult that the average life span was allot shorter!!! nothing like a good magical trick performed by MUM!! You're good. Sneaky, but good. Don't worry T, all will come out in therapy in later years. Well considering you manage to keep three small children alive I don't think you need to also be responsible for the fish! Pass that buck lady! Is it appropriate to compliment your photo even though I'm imagining that is a mug shot of the offender? Evil, clever, smart, dodgy, sensible.... you walk such a fine line! 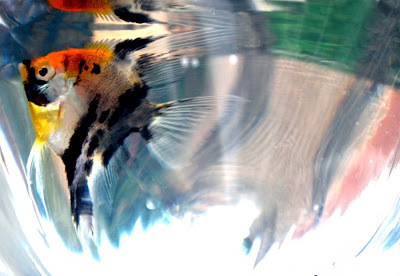 Wonderful - are you claiming your fish tank as your creative space for the week? Ah yes, fish. I had two - Tilly and Miles the googly eyed black fish. I didn't seem to have the aqua thumb. I got up to Tilly V and Miles IV before I accepted that fish were obviously not my kindred pet ... I am still traumatised. By the time the kids notice ... just tell them aforementioned fish has put on a little weight and is feeling a little sensitive so sshhhhhhh! Our fish has periodic overnight trips to the vet for a check up...oldest is nearly 6 and still seems to be OK with this story. He could be humouring his parents but I'm not going to ask! Lisa. I commend your sneakish ways. Many a fish had been "decorated" while the kidlettes were away. They never questioned Mommy's strange habit of coloring fishes when she got tired of their same old look. eeek to nasty beasts eating other. there was a nasty day when salt, the dwarf hamster, ate pepper, his brother. mum didn't get to the cage in time to remove the leftovers....so hey at least you spared your little ones that! Oh dear. We had a similar incident recently which didn't end so well - my 7 year old found one of our tabbies clutching half of the other tabby. The fish were happily nibbling on the other half. Ahahahaha! The vegan in me says poor fishy but the evil child in me says hehehehe!! That's hilarious. But sad. But funny. You're too much! !